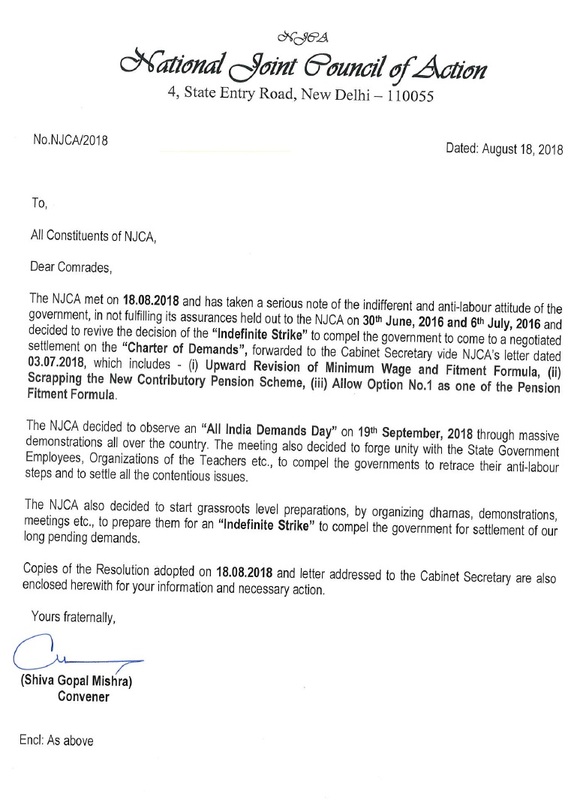 The NJCA met on 18.08.2018 and has taken a serious note of the indifferent and anti-labour attitude of the government, in not fulfilling its assurances held out to the NJCA on 30th June, 2016 and 6th July, 2016 and decided to revive the decision of the “Indefinite Strike” to compel the government to come to a negotiated settlement on the “Charter of Demands“, forwarded to the Cabinet Secretary vide NJCA’s letter dated 03.07.2018, which includes – (i) Upward Revision of Minimum Wage and Fitment Formula, (ii) Scrapping the New Contributory Pension Scheme, (iii) Allow Option No.1 as one of the Pension Fitment Formula. The NJCA decided to observe an “All India Demands Day” on 19th September, 2018 through massive demonstrations all over the country. The meeting also decided to forge unity with the State Government Employees, Organizations of the Teachers etc., to compel the governments to retrace their anti-labour steps and to settle all the contentious issues. The NJCA also decided to start grassroots level preparations, by organizing dhamas, demonstrations, meetings etc., to prepare them for an “Indefinite Strike” to compel the government for settlement of our long pending demands. Copies of the Resolution adopted on 18.08.2018 and letter addressed to the Cabinet Secretary are also enclosed herewith for your information and necessary action.